The character classes all conform broadly to the classic Dungeons & Dragons stereotypes. First up is a tank character in the form of the Paladin, who has the most health and does the most damage. Then there is the Wizard, who is physically weak but has a powerful spell (just the one, though). Finally (for now, the full version will additionally have a Warlock character) there is the Ranger, who is fast with a larger health than the Wizard but a weaker, albeit ranged, attack than the Paladin. The Ranger also throws bombs that look like they come out of a 1950s Warner Bros cartoon. Meep Meep. This special action, a charge attack for the Paladin, a fanned flame spell for the Wizard, and the ACME-esque bomb for the Ranger, is essentially defined by your 'mana/stamina' bar, for want of a better term. To replenish it you must pick up the numerous glowing blue crystals you find in the dungeon. Your wounds are healed by finding and eating apples, which is a rather extreme interpretation of the age-old maxim 'An apple a day keeps the doctor away'. As with all good dungeon crawls, the idea that there might be a plot is laughably naïve. Likewise, all good dungeon crawl staples are here, smashable objects that reveal either nothing, cash, or a trap, monsters that change colour in later levels to indicative increased toughness, hidden switches and random merchants who decided there was a bit of coin to be made by setting up shop in a dungeon surrounded by monsters miraculously indifferent to the presence of a small businessman in their midst. 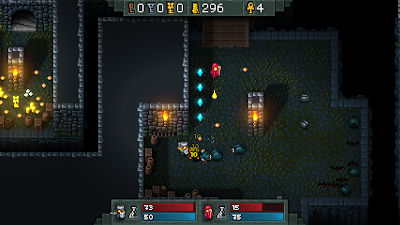 There is also a multiplayer option that will be reviewed here in the final build, but for now we can say it's a nice touch and in today's world is essential for any Gauntlet-esque dungeon hack game. The [direct IPS] implementation also means it's not reliant on third-party servers to stay in existence. In non-geek speak it means that Hammerwatch will always be playable online as long as you have the internet and a friend to play it with. The developers can't help you with the friend but they've done their best for everything else. The full version will also have a save mode, which will help the game be digested in more manageable chunks. Currently you have to play through what is there in a single sitting and although it’s supposedly doable in an hour it starts to get monotonous well before then. Given the title screen displays future locations and enemies in the background, it may be an idea to make them accessible much quicker than they currently are. 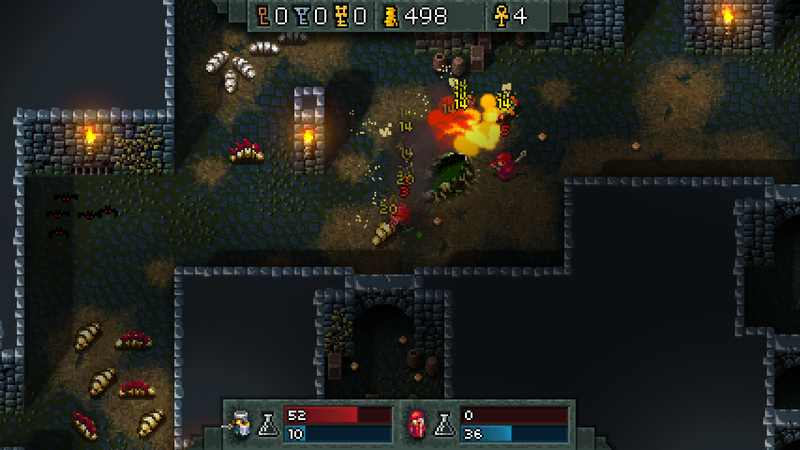 Fans of the genre may expect they could happily play through Hammerwatch time and again, happily defeating swathes of enemies with friends in tow. However the game doesn't make much of an effort to differentiate itself from the pack, with the result that while it starts off fun it becomes repetitive due to over-familiarity with the genre, which let's face it is 30 years old now. It's a bit like a fan of rock music trying to justify Motley Crue to someone who isn't a huge rock fan. As an aficionado you may appreciate the riffs and solos, however derivative, but to someone with a casual interest they're just the same as every other band with big hair and even bigger cucumbers stuffed down their pants. And if they're going to listen to rock then they'll listen to Led Zeppelin anyway. Hammerwatch is essentially Gauntlet viewed from a slightly different angle, but crushingly, not as good. Similarity is not necessarily a bad thing, but it means it is appealing directly to an audience that will know exactly what to expect as soon as the game starts. 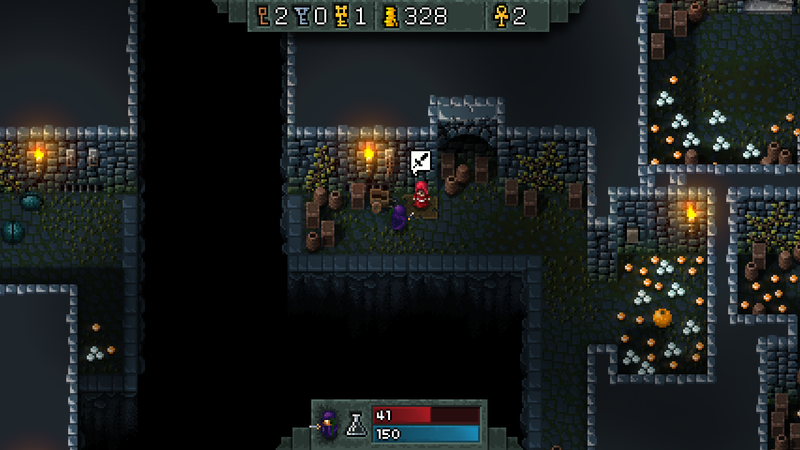 This is comforting for those who wish for nothing more than a fun dungeon crawl, but those hoping for a new twist on the genre may be a little disappointed. It's possible that the slower pace of Hammerwatch when compared to a quarter-swallowing (or 20p swallowing, which doesn't sound as cool) coin-op like Gauntlet means the game requires something to make up for the lack of frenetic action. It does have a crude skill tree system, with extra and improved abilities such as combos being available for purchase from the merchants placed around the dungeon. It's a good idea but some visual representation of your skill tree feels necessary if you're going to develop your character over the course of the entire game. Meanwhile the odd puzzle mixes up the pace somewhat but it's not quite enough to drag the game out of its stupor. The Survivor mode is a welcome addition but even with the usual caveats about the fact that this is, after all, only a beta, you hope they plan a bit more for it than simply fighting a wave of enemies in a big square. Not least because dying when surrounded by enemies means spawning surrounded by enemies and can lead to multiple quick, and frustrating deaths. In fact, as far as this preview goes, the game feels pretty slick and complete. The graphics are great, as is the music and it plays pleasantly free of glitches. It could do with one or two tweaks, the menu colours could do with better differentiation when you alight on one, menu control via a controller would be expected while the balance of power between character classes feels a little off. The game plays much easier with the Ranger due to the ranged attacks and pace with which you can keep distance between yourself and the enemies. The difficulty when playing with other characters comes mainly from how quickly you can die once you start getting hit by enemies. 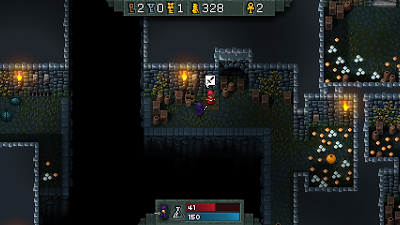 The rate at which your health drops when hit is roughly approximate to Gauntlet, yet in Gauntlet you start with a health of 3,000, and in Hammerwatch it ranges from 30 to 100. This is somewhat offset by having a number of lives but it feels too unforgiving when you get caught out by enemies, especially given the length of the first act that is playable in the beta. Hammerwatch has a great look and the instant recognisability is one of its strengths. However, unless it thinks of a way to properly differentiate itself from the rest of the genre it will also become a weakness. It's possible that all this is planned to be fixed in the later levels, in which case you could argue that with such a familiar genre it needs to get to the action much quicker and introduce more variety into the game or even fans of the genre may lack the willpower to see it through to the end. 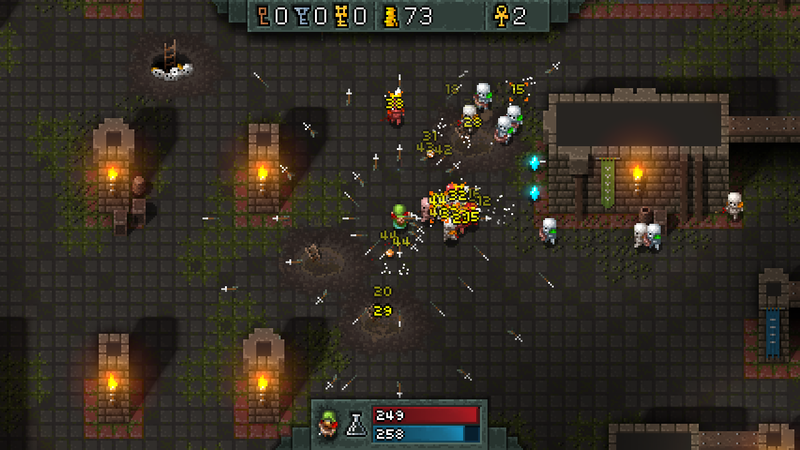 Hammerwatch is a game with a lot of potential but the enjoyment tails off as the game becomes a dungeon grind. With some tweaking it could still become a very solid full-length release. Download the demo here (from the Hammerwatch website). Although it feels a little more complicated than necessary to set up a Hammerwatch multiplayer match, the experience is far more rewarding than the single player mode. The recent beta update does make the experience a lot easier, with a better interface making it easier to set up and join a game. The confusion will come to anyone not used to dealing with Direct IP online play, and while the instructions will just about see you through, it's probably going to be confusing for more casual gamers trying to work out how to sort out their ports and IP issues. Nonetheless, once you're actually in the game and playing with friends it's a lot of fun. The pace feels quicker when there are more of you and therefore overcomes some of the solo play’s shortcomings. When testing there was an issue with semi-frequent drop-outs, but we couldn't work out if it was due to a poor internet connection or the game. What was clear was that there are no instructions on what to do when someone drops out, as this causes everyone to wander round their own version of the dungeon. With no instructions on what to do when this happens (we contacted the developer who later told us that the host needs to remain in the game while everyone else drops out and rejoins) it meant starting again, which after a couple of times became boring and essentially ended the session. If we'd had the instructions on what to do with the game beforehand it would have avoided this situation. As with most things in life, it appears that Hammerwatch is an experience best shared with friends. Although there are still a number of kinks to be worked out before the full release experiencing the multiplayer leaves you with a lot more optimism for the quality of the final product. 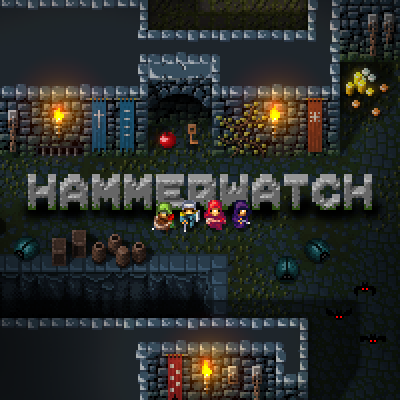 I have to concur that my experience of playing Hammerwatch was pretty much exactly as how Alex describes above - initially I was wowwed by the cute graphics, procedural (random) dungeon creation and instantly intuitive gameplay, but I soon started to feel increasingly bored by the pace and lack of variety. In a dungeon crawl I want to be hacking and slashing the archetypal goblins, orcs, kobolds, trolls, skeletons and demons from the outset - not just bats and maggot-type critters. Seriously, by the time I got to the second level and noted that the only different enemy was a 'spiky' maggot, I had to switch off and play Hack, Slash, Loot to get a proper dungeon-romp fix. This is a real shame, because aside from this (and the other issues Alex has raised), Jochum Skoglund and Niklas Myrberg have crafted an excellent game. I really hope that the final will present players with a chaotic mix of enemy types from the outset in a similar style to the arcade classic that it is so obviously inspired by.